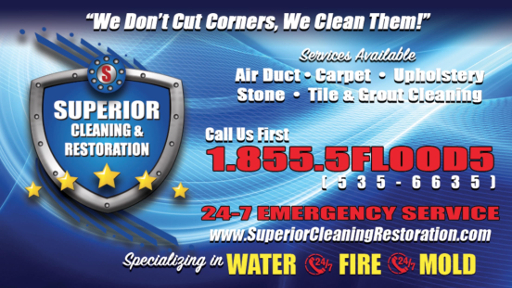 Superior Cleaning and Restoration Inc. has been serving the people of Encinitas with carpet cleaning services for years. What sets us apart from our competitors is the fact that we use only hot water extraction units that are truck-mounted and couple the extraction units with some of the most eco-friendly cleaning products available on the market. Most carpet manufactures recommend this method; you can be assured that your carpets are in safe hands with us. The business of carpet cleaning is a competitive one, we strive to achieve perfection and for that we come fully equipped for any kind of situation. So be it a simple stain removal or an issue of a nasty musty odor emanating from the carpet, we have multiple methods to tackle and resolve any problem. Superior Cleaning and Restoration Inc. is your one stop solution to keeping those beautiful looking rugs and carpets looking as great as the day you purchased them. Mold and mildew on carpets and rugs can result in health issues. Superior Cleaning and Restoration Inc. can help in the successful resolution, we provide remediation and prevention services to control and eliminate mold and mildew from spreading. The indoor air quality in your home is important. There should be no mold, mildew, odors or bacteria issues anywhere in order to preserve good health. As an additional service we also provide Teflon Carpet Protectors, which we recommend as a life saver when it comes to carpet/rugs preservation. The protector is ideal for areas that suffer wear and tear due to heavy traffic and it also helps prevent staining that may be caused due to pets, dirt and food stains.